RuggedCover Tonneau Covers are available with tri-fold and snap-on vinyl tarps. 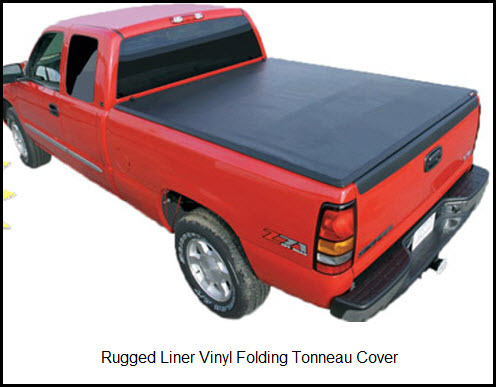 RuggedCover Tonneau Covers are manufactured by Rugged Liner, Inc. in Owosso, Michigan. Two large facilities, both ISO certified are responsible for the shipping, receiving, manufacturing and administrative functions of the company. Rugged Covers makes pickup truck bedliners, trailer bedliners, truck bed mats and wheel well liners as well as a line of 3 folding tonneau covers and a single snap on tonneau cover. Rugged has a great idea - mostly preassembled parts are used in the snap on cover while the folding covers comes fully assembled. So you get very little or no assembly and a lightweight truck lid. That means you can install any of these tonnos yourself. You can use universal absorbent mats to keep the floors, mats and truck bed area clean, dry and smelling good. Here is a little more info on the hard fold, soft fold, tri fold and snap on tonneau covers from Rugged Covers.